This week’s minorities in cartoons entry is Harley Quinn (real name: Harleen Quinzel), a Batman supervillain who appears in DC Comics. Harley first appeared in 1992’s “Batman: The Animated Series” TV series. She was created by series heads Paul Dini and Bruce Timm. 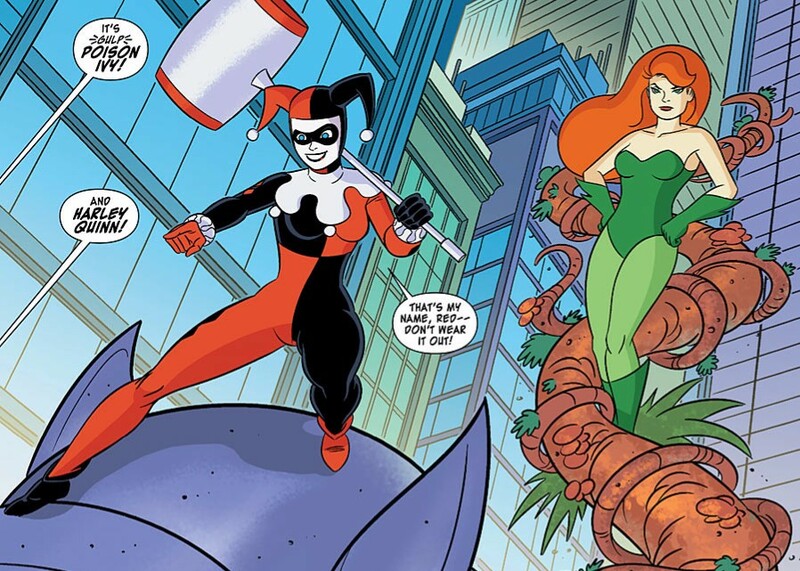 Harley also became friends with, and an occasional partner of, fellow villain Poison Ivy. Despite Harley’s affection toward “Mistah J” (as Harley called Joker in her thick New Yorker accent), Joker showed no affection in return. Harley Quinn quickly became one of the most popular characters on “Batman: The Animated Series.” She was quickly introduced into the TV show’s spinoff comic, and also the regular DC Universe. In the DCU, Harley kept most of her backstory and friendship with Poison Ivy. However, all of it was modified to better fit into mainstream DC Comics (i.e., made darker and more violent). As time wore on, Harley lost her in-story connections to the Joker; just as well, given his mistreatment of her. She’d also become popular enough to get her own self-titled comic. Recent versions have made Harley into more of an anti-hero than a villain. Nowadays, Harley’s treated as basically DC’s answer to Marvel’s Deadpool. She’s also (at this writing) one of DC’s top-selling female characters. Like most Batman villains, Harley has no powers. She makes use of athletic skills, as well as various harlequin/clown-themed weapons. Her trademark weapon’s a giant carnival mallet, used as a club. Several stories also imply Harley’s Jewish, though she’s expressed an enjoyment of Christmas. On the kid-friendly side of things, Harley’s one of the characters in DC’s “DC Super Hero Girls” line. There, she’s Wonder Woman’s roommate. Harley’s also been retroactively introduced to the world of the Adam West “Batman” TV series, via the “Batman ’66” comic.